6.38 points at 13 votes (rank 549). As a heavily armed humanoid you need to slap through more than a hundred sections to repel the alien threat successfully. With your laser weapon you just clear obstacles. Stronger enemies are eliminated by a grenade. 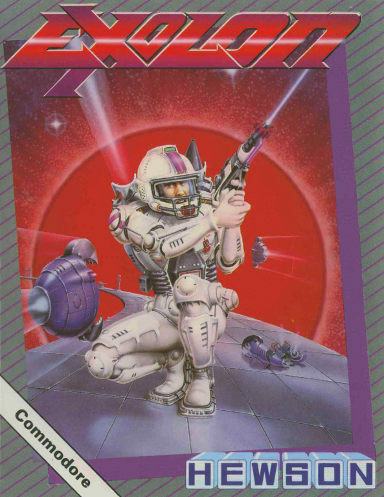 As extras in higher levels there is an improved protective armour or a double laser weapon. Each section has a time limit. Crossing this leads compulsorily to the loss of a life by a hostile spaceship. Coloured 2D graphics without scrolling. Music is only played in the title menu. During the game there are sound effects. In the lower status bar the following is shown: ammunition, grenades, current score, number of lives and the current zone. A searching missiled can be tricked with the help of a teleport. 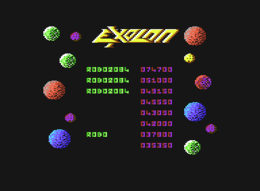 Werner: "Exolon is a simply kept skill game. Graphics and sound are average. The game offers little diversification, but it is well playable. 6.5 points from me." 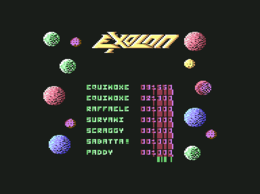 mombasajoe: "Everyone who owns a C64-DTV knows Exolon. Period. Because it is on it. Period. It is not really bad. It is not really good. It is not in my DTV any more. Period. Why? Because it is meaningless." 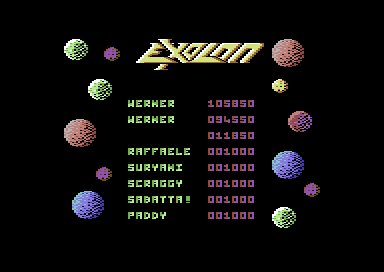 Exolon was originally created for ZX Spectrum by Raffaele Cecco. 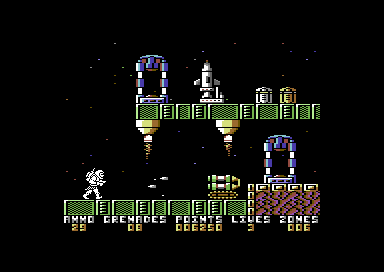 The C64 version was developed by Nick Jones, who also converted several other Cecco's Spectrum games for C64. 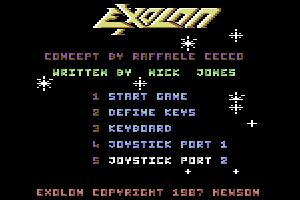 Jones also made the title music for both the C64 and Spectrum versions of Exolon. This page was last modified on 1 March 2015, at 15:32.